In this marvellous Bernese farmer’s house, tradition meets the modern age and well-tried methods are being combined with new ideas. 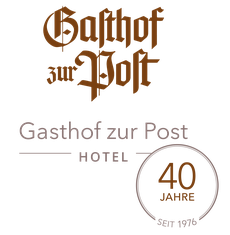 For many decades, this hotel has been family-run and warmth and hospitality have always been high on Gasthof zur Post’s list of priorities. Enjoy the breath-taking views of the Bernese Alps and let us spoil you! We will do our best to make your stay with us an unforgettable experience. Book directly - best price guarantee! If you book your stay with us directly in our hotel, we guarantee that you get the best rates! Do not hesitate to have a look at our reasonable packages including skipass for the skiing area of Hasliberg. Should you wish to receive more information, please contact us here. To say "thank you" to our guests, we clebrated our 40th anniversary with a big party. Our hotel and restaurant are closed from 20th May until 18th June. We are looking forward to welcoming you again from 19th June on!